The letter Χ means foundation. Chi- (χι-) is a prefix meaning cross, crosswise. The foundation of the Washington Monument in Washington D.C. is indicated on the illustrations, below, with an “X” within a square. There are a limited number of words that begin with the letter Χ, however, many words contain the letter Χ at the very beginning, and reflect the meaning of “foundation,” such as the following. Archaios (άρχαῖος) means from the beginning or origin, ancient, old, the basis for the word archaic. “. . . no building can be said to be well designed which wants symmetry and proportion. In truth they are as necessary to the beauty of a building as to that of a well formed human figure, which nature has so fashioned . 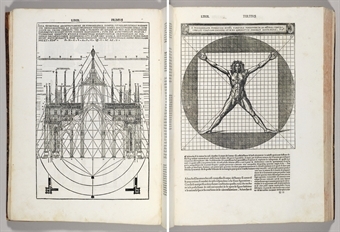 . .
An illustration in De Architectura Liber Tertius (Book Third), demonstrates the proportions between a human body, circle, and square. Note the repeated use of “X’s” on the building illustration on the facing page. Achaios (Άχαιός) means the Achaeans, a term used in Homer’s works to refer to the Greeks in general. Ochee (οχή) means a prop or support. Ocheia (όχεία) means fertilization or to impregnate. Ocheuma (όχευμα) means embryo, literally “intact-entity foundation.” An ocheion (όχεῖον), an ox, is a male animal kept for breeding, for impregnating, such as a stallion or bull. Stach- (στᾰχ-) is a prefix meaning corn, a diet staple. A stachus (στάχυς) is an ear of corn and the name of the chief star in the constellation Virgo (August-September). Stoicheion (στοιχεῖον) means element or fundamental principle. Techn- (τεχν-) is a prefix defined by the Lexicon as meaning art, the basis for the word technology. Techno (τεχνόω) means to instruct in an art or technique. Technos (τεχνος) means skills. Chaios (χάϊος) and chaos (χᾱός) mean genuine, true, good. According to Hesiod’s Theogony (an account of the origin of the universe written around 700 BCE), Chaos (Χάος) existed prior to everything else. Embraced the long far margin of the land. Chthonios (χθόνιος) means in, under, or beneath the earth; sprung from the earth. Chous (χοῦς) means soil excavated or heaped up. Choo (χόω) means throw or heap up earth; raised mounds; cover with earth, bury. Chutra (χύτρα) means earthen pot, earthenware, pottery. Choma (χῶμα) means earth thrown up, bank, mound; sepulchral (tomb) mound; heap; dyke. Chophorion (χωφοριον) means a load of earth. Chamai (χᾰμαί) means on the ground. Chamadis (χᾰμάδῐς) means on the ground, to the ground. Cham- (χαμ-) and chamai- (χᾰμαι-) are prefixes meaning ground. Chamaikoitia (χᾰμαικοιτία) means lying or sleeping on the ground. Chamaimeelon (χᾰμαιμηλον) means earth-apple, chamomile, a low-growing perennial so-called because of its apple-like scent. Charma (χάρμα) means source of joy, delight. Recall that chaios (χάϊος) means genuine, true, good. Chara (χᾰρά) means joy, delight. Charis (χάρις) means grace, beauty, kindness, goodwill. Charis (Χάρις) are the Charites, the Graces, the immortal Goddesses of grace and beauty. Chartos (χαρτός) means causing delight. Charieis (χᾰρίεις) means graceful, beautiful, gracious, elegant, clever, smart, kind, courteous, cheerful. Chairo (χαίρω) means rejoice, take pleasure in; gladness, delight, joy. Choes (Χόες) is the second day of the Anthesteria celebrated in honor of the immortal Goddess Persephone to commemorate her reunion with her Mother, Demeter. (Willam Smith. Dictionary of Greek and Roman Antiquities.) The Anthesteria, celebrated in February/March, also commemorates deceased loved ones. Choee (χοή) means pouring out of liquids, drink-offering, especially to the deceased over their graves. Choiniks (χοῖνιξ) is the choenix, a dry measure of corn, one person's daily allowance of corn. Demeter is the immortal Goddess of corn and other grains. Choira (χοίρα) is a sow; choiros (χοῖρος) is a young pig. Pigs are sacred to the immortal Goddess Demeter. Choir- (χοίρ-) is a prefix meaning pig. Chloia (χλόϊα) is the festival of Demeter Chloee and her daughter, Koree (Κόρη), at Eleusis. Chloros (χλωρός) means greenish-yellow, pale green, green, fresh, the basis for the word chlorophyll. Chnoao (χνοάω) means the bloom of the first down, of fruit; downy. Below, an image of Charon and Hermes, two immortal Gods charged with conveying people to and from destinations. Charon’s role is restricted to the netherworld. “Oracles” of ancient Greece directly channeled divine will while seated over a chasm (χάσμα, χάσις) in the earth. “Oracles” had the first and last word on matters of state and other weighty issues. Chree (χρή) means something that ought to have been; fate, destiny. Chreezo (χρήζω) means deliver an “oracle,” foretell. Chreesis (χρῆσις) means employment/use of a thing, usage; “oracular” response. Chreesmos (χρησμός) means “oracular” response, “oracle,” prophecy. Chreestees (χρήστης) means one who gives or expounds “oracles,” prophet. Chreestos (χρηστός) means useful, good of its kind, serviceable, wholesome, pleasant, nice, worthy, kindly. Chreestotee (χρηστότη) means goodness, honesty, uprightness, kindness. Chreo- (χρεω-) is a prefix meaning debt, obligation, necessity. Chreos (χρεός) means that which one must pay, debt, obligation; debt due; the debt that one must pay; fate; death. Chreo (χρέω) means want, need, necessity, destiny, fate; “oracle,” prophesy. Chreon (χρεών) means that which must be; necessity, fate. Chreia (χρεία) means need, want, necessity. Chreios (χρεῖος) means needing, in want of, needy. Chateo (χᾰτέω) means crave, need. Cheeteia (χητεία) means want, need, lack. Chreema (χρῆμα) means need, a thing that one needs or uses; goods, property, treasures, heirlooms, sum, fund of money, merchandise. Chreemato- (χρημᾰτο-) is a prefix meaning wealth, money. Cheir (χείρ) means in hand, the hand whether closed or open; under control, take matter in hand; in one's power. Cher- (χερ-) is a prefix meaning hand. Chersos (χέρσος) means dry, un-irrigated land, barren, perhaps to indicate land that needs to be cultivated by hand. The ancients calculated time by observing heavenly bodies’ interaction with the surface of the earth and with eachother. The sundial measures time by where the sun casts its shadow. The moon/calend/month is reckoned by observing the sun’s rays as they reflect on the surface of the moon. The 12 zodiac periods are reckoned by when the first sign of each constellation breaks the earth’s horizon. Chronikos (χρονικός) means chronological, concerning time. Chronizo (χρονίζω) means spend time. The chorus in theater and music is the foundational element. Orchas (όρχάς) means enclosing. The orcheestra (όρχήστρα) is the space in the theatre on which the chorus dances, literally “intact-entity outflow-of foundation.” Chord- (χορδ-) is a prefix meaning a string of guts, as used in musical instruments. Choros (χῶρος) means a definite space, piece of ground, place; land, country. Choros (χορός) means chorus, choir, a band of dancers and singers. Choro- (χορό-) is a prefix meaning chorus, choral dance. Choreia (χορεία) is a dance, especially a choral dance with music. Choriambikos (χορῐαμβικός) means choriambic, a foot of four syllables (- υ υ -) consisting of a chorius (-υ) and an iambus (υ -). A chorion (χόρῐον) is the membrane that encloses the fetus in the womb; the membrane round the inside of the egg; any intestinal membrane. Chortos (χόρτος) means feeding-place, feeding-ground, pasturage. Choronos (χορωνός) means encircling crown, corona. Ruchion (ρύχιον) means mine, such as a copper-mine, literally “outflow pure foundation.” Rochmee (ῤωχμή) means fissures. Chrusion (χρῡσίον) means gold, a piece of gold, anything made of gold, gold coin, money. Chumeia (χῠμεία) means alchemy, the art of alloying metals. Chalk- (χαλκ-) is a prefix meaning copper, brass, bronze. Schasma (σχάσμα) means incision, literally “synchronized chasm.” Schizo (σχίζω) means split, cleave. Chasko (χάσκω) means yawn, gap, chasm. Charadree (χαράδρη) is a mountain stream which cuts itself a way down the mountain-side; the bed of such a stream, gully, ravine. Chrio (χρίω) means touch the surface of a body slightly, graze, rub, anoint, anoint with scented unguents or oil; anoint a suppliant; wound on the surface. Chroia (χροιά) means skin, surface. Chrauo (χραύω) means scrape, graze the surface. Chrozo (χρῴζω) means touch the surface of a body, touch, tinge, stain, paint. Chroma (χρῶμα) means skin; color; complexion; tinge, the basis for the word chromatic. Chros (χρώς) means skin; color. Charaktar (χᾰρακτήρ) means engraver. Charasso (χᾰράσσω) means make pointed, sharpen, whet. Charak- (χᾰρᾰκ-) is a prefix meaning stake, as used to form a palisade or fence or to prop grapevines. A charaks (χάραξ) is a pointed stake. Charagma (χάραγμα) means any mark engraved, imprinted, or branded; inscription; stamped document; stamped money, coin; character. Charto- (χαρτο-) is a prefix meaning papyrus, paper, the surface upon which one writes; chart. A chartopatees (χαρτοπράτης) is a dealer in papyrus. Cheo (χέω) means pour, let flow, become liquid, literally “foundation essence brings-forth,” perhaps in reference to the liquidity of lava. Chudaios (χύδαῖος) means poured out in streams. Chudeen (χύδην) means poured out in floods or heaps. Chulos (χῦλός) and chumos (χῦμός) mean juice. Chuma (χύμα) means that which is poured out or flows, fluid. Chusis (χύσις) means pour forth, stream. Cheima (χεῖμα) means winter weather, cold, frost, literally “foundation essence divine,” perhaps reflecting the coldness within the earth, such as in caves. Chion (χιών) means snow. Chion- (χῐόν-) is a prefix meaning snow. A chlaina (χλαῖνα) is an upper garment, cloak, wrapper worn loosely over the chiton; blanket. A chlamus (χλᾰμύς) is a short mantle worn by the military. A chlanis (χλᾰνίς) is an upper garment of wool worn by men and women. A chiton (χῐτών) is a garment, tunic, coat, covering worn by both men and women. Chelus (χέλυς) means tortoise shell, anything like the shell of a tortoise. Chelonee (χελώνη) means overlapping shields, a military technique. Chimaira (Χίμαιρα) means Chimaera, a three-headed, fire-breathing monster, explained as mythical for a volcano. Chimaros (χίμᾰρος) means young male goat. Chimaira (χίμαιρα) means female goat. Goats are easily domesticated, useful for their milk, meat, hair, and hide. Cholos (χωλός) means lame, halting, limping. Chola (χολή) and cholos (χόλος) mean gall, bile. Cholas (χολάς) means bowels, gut, stomach. Cholao (χολάω) means to be full of bile, to be melancholy (black-biled). Cholera (χολέρα) is a disease in which the humors of the body (χολή) are violently discharged by vomiting and stool; nausea. Chalbanee (χαλβάνη) is the resinous juice of all-heal, Ferula galbaniflua. Cheironeios (Χειρώνειος) is Cheiron's all-heal, Hypericum olympicum, bryony. Chaitee (χαίτη) means loose, flowing hair; a horse or lion's mane; the crest of a helmet; a tuft of the papyrus plant. Chazo (χάζω) means drawback or retire from; bereave or deprive of. Chaldaios (Χαλδαῖος) means Chaldean (Babylonian/modern Iraq). Chalepto (χᾰλέπτω) means oppress, crush. Chaunos (χαῦνος) means porous, spongy, loose-grained. Cheia (χειά) means hole, especially of serpents. The name of the letter Χ is χεῐ, so that cheia (χειά) literally means “foundation arising.” Snakes are “ambassadors” of the earth and the regions below the earth’s surface. Chthes (χθές), chthizos (χθιζός), and chthisdos (χθίσδος) mean yesterday. Chida (χιδά) means to be shuddered at, awful. Chidaleon (χιδαλέον) means closed with no outlet. Chidra (χῖδρα) and chidron (χῖδρον) mean wheaten-groats; whole-grains; bulgur. Chili- (χῑλι-) is a prefix meaning thousand, a prefix for many words. Chilos (χῖλός) and chilo (χῖλόω) mean fodder for cattle, forage, hay. Chleuee (χλεύη) means joke, jest, mock. Chondros (χονδρός) means granular, coarse; a granual or lump. Chrem- (χρεμ-) is a prefix meaning neigh, whinny, roar, expectorate, clear one's throat, cough.